Outreach and networking expand your base of operations, and even though you may feel a little constrained by circumstances beyond your control there are ample reasons to have confidence in your plans. Getting out into the fresh air or spending time in natural settings has an amazing effect on your outlook. Company or team sports can be fun, but if you re competing alongside coworkers pay attention to their attitudes to avoid unnecessary hostility. Inspired by a desire to deepen your bond with your lover, you may be more dramatic about your affections from October 1 to 17. Your grand plans and dreams can be a bit over the top, though, and to avoid creating disappointment, make an attempt to begin on a realistic base during the Moon on October 9. Family pressures can escalate to a peak during the Moon on October 24, when you may need to give someone room to ventilate. Expectations surrounding your career, whether arising from superiors or your own desires, can create a trap. Distinguishing reality form rumor can be tricky, but it’s necessary to have some sense of direction unless you like the feeling of navigating blindfolded! 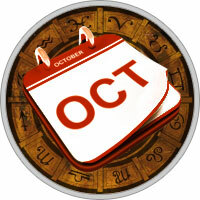 You can direct changes from October 1 to October 6, and you may have excellent options after October 26. Set budget plans in motion from October 9 to 23. By remaining alert to what’s happening beneath the surface and avoiding the tendency to take things (or people) at face value you’ll make progress. Otherwise, you lose time and energy.